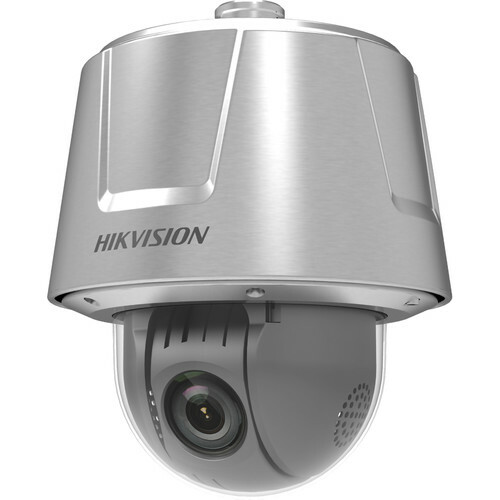 The DS-2DT6223-AELY Dark Fighter Series 2MP Outdoor Anti-Corrosion PTZ Network Dome Camera from Hikvision features a 1/1.9" progressive scan CMOS sensor that allows it to capture images at a maximum resolution of 1920 x 1080. The camera also features a 5.9-135.7mm auto iris varifocal lens with 23x optical zoom and a viewing angle of 59.8 to 3°. An integrated mechanical IR cut filter enables true day/night functionality. It also features Smart Defog and EIS (Electronic Image Stabilization), which help improve image quality in challenging conditions. This camera is made of anti-corrosive 316L stainless steel that effectively avoids acidic and neutral salt fog corrosion. It also has IP67 and IK10 ratings for protection against harsh weather conditions and acts of theft or vandalism.